Teacher suspended after setting "racist maths exam"
A teacher has been suspended after handing out a "racist maths quiz" to her year nine students. High school teacher Jane Bolser, for reasons unknown, decided that the way to engage her students in her class was to make her tests a whole lot more racist. One of her pupils showed the quiz to their mother, who reported it to the school. "Dwayne pimps 3 ho's. If the price is $85 per trick, how many tricks per day much each ho turn to support Dwayne's $800 per day crack habit?" Even more bizarrely, the class she was teaching at the time was Language Arts, not Maths or an introduction to racism. The answer to number three is 3.3 tricks per "ho" per day, assuming Dwayne's crack habit remains constant. Never a sure thing with crack addiction, and you should always take variables like this into account. 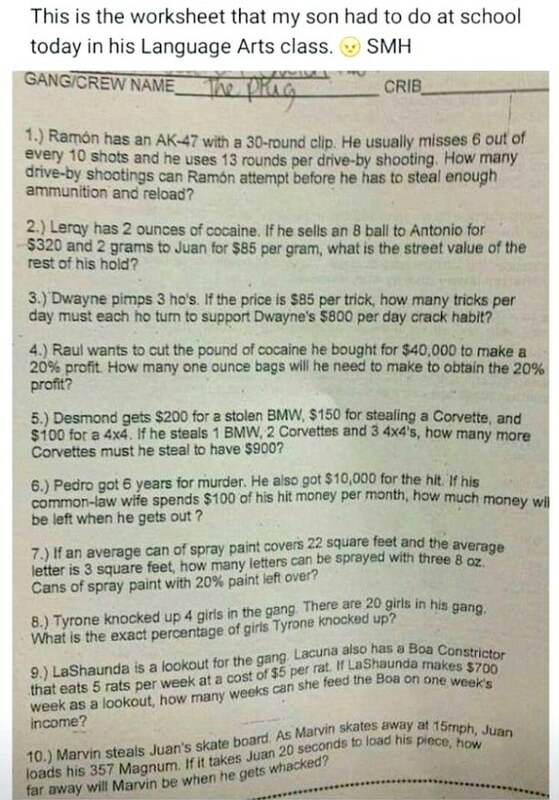 The quiz was criticised by one of the mothers of the students who sat the test for the content relating to guns, drugs and prostitutes. As a result, Joanne has been placed on administrative leave from her school in Alabama. "We regret this happened. We have 7,500 employees at Mobile Public Schools and we overwhelmingly have excellent teachers." "This is a shame that it’s taking away from their work." So far no-one has criticised the maths element of the test, which was universally deemed as "about right" for a year nine maths class. Like this? You’ll like these freebies even more.